Emil L. Wetzel, age 87, of the town of Saukville, WI, died Tuesday, February 23, 2016 at Lawlis Family Hospice in Mequon. He was born September 15, 1928 in Milwaukee to Emil and Ruth Londo Wetzel. He grew up in Milwaukee and married Lorraine Miller on January 17, 1948 in Milwaukee. Emil worked for American Motors. 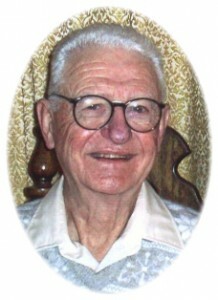 In 1958, he moved the family to the town of Saukville. He farmed there and also worked for the Northern Ozaukee School District Building and Grounds Department. Later, he retired from the Shorewood School District Building and Grounds Department. His wife Lorraine preceded him in death October 7, 2009. Emil was a family man who loved the outdoors. He liked to fish and hunt, teaching his children lessons of nature along the way. He took a couple fishing trips to Canada and enjoyed snowmobiling in Michigan’s Upper Peninsula. A true handyman, he enjoyed working with his hands. He built the houses he lived in. He is survived by his children Wayne (Connie) Wetzel of Port Washington, David (Karen) Wetzel of Belgium, Linda Huberty of Sheboygan and Diane Biever of Saukville. He is further survived by 13 grandchildren, 27 great-grandchildren, 2 great-great-grandchildren, his sister Emily Wetzel, other relatives and friends. Emil is preceded in death by his wife Lorraine and his brother Dennis Wetzel. Pastor Martin Wildauer will officiate Memorial Services 11 am Saturday, March 12, 2016 at St. Matthew Lutheran Church, 1525 N. Grant Street, Port Washington. Visitation from 10 – 11 am Saturday, March 12, 2016 AT CHURCH. Previous Post: Lange, Marga K.
Next Post: DeSmith, Muriel J.
I have fond memories of Emil. We worked together at Northern Ozaukee School District for many years. He was a very kind and soft spoken man with high integrity. It was a privileged to have known him in my life’s journey. May God’s peace be with all of his family. Rest in peace, Emil.